NCAA Tournament Live Blog: Thursday, 12:20 p.m. Your live blogger today is Dan Shanoff, whom you might remember from ESPN.com, the Harvard Business School and chatting up redheads at the AJ Daulerio Roast. We're happy to have him here, and his big words of wisdom begin after the jump. And hey, have fun everybody. 2:30: Even though Louisville and Stanford have a few minutes to play, it's over. (Even Gus Johnson sounds deflated.) So I'm going to wrap up this early-afternoon portion of the live-blog and encourage you to head on over to the live-blog posts dedicated to the late-afternoon games. See you there! 2:28: Maryland staves off elimination and a spirited effort from Davidson to advance. 20 minutes or so of a break in Buffalo before we get to a super-intriguing 5/12 between Butler and ODU, winner getting the Terps. 2:25: Looks like Maryland is about to seal it up. I have Maryland going to the Sweet 16 (yes, I'm sure you care), so I'm mildly relieved. But really: Wouldn't you rather have seen the 13-quality upset? Interesting: I couldn't care less to hear about your fantasy baseball draft, but I have limitless patience to listen to the details of your bracket. Anyone else feel similarly? 2:19: This Davidson-Maryland game makes up for the fact that Stanford is in contention for the worst at-large of recent memory. 2:18: Whew. We all now get to watch Maryland-Davidson... just as the game is nearly over. Sweet. How about a last-minute run from Davidson (or, if you're a "half-empty" fan, a last-minute collapse from Maryland)? 2:16: Woohoo! BC beats Texas Tech! 1-0 on my bracket! Who's with me? 2:13: Screw it. I don't care that Texas Tech is still technically in a winnable situation. Give me Maryland-Davidson. Now. 2:06: Like an election night, as games wind down, the challenge is figuring out when to "call it." Like perhaps, when Dudley just hit that turnaround in the lane to put BC up 7. If you picked Maryland to win this game, would you rather (1) Be Right (as a Bracket-picker), or (2) See the Upset (as a college hoops fan)? Is there the equivalent of the NFL coach "2-point conversion" chart to figure out how far you have to have a favorite going before you can root against a great upset? I think perhaps your personal bracket fortunes simply aren't important enough to root against upsets that make the Tournament so great. 1:38: Davidson! Pool-wrecker! Blazing start to the second half! (It's nearly time to start asking who had Davidson winning...and who is the Deadspin reader who had Maryland going the farthest? Oh, calm down: I said "Nearly." 1:32: Obviously, Jared Dudley is tougher than Tyler Hansbrough, because his face didn't come apart on a hard foul to the basket. On the other hand, the foul wasn't intentional like Henderson's was. Say this for Bobby Knight-coached teams: They know how to hard-foul without intentionally fouling. Classy! 1:26: "Hills Have Eyes 2: Electric Buglaoo." Yeesh, gruesome ad. Any minute now, a preview for "Hills Have Eyes 3: Stanford Has Wasted an At-Large Invitation"
1:18: Some people don't like announcer Gus Johnson, but I love him when he does Tournament games. It seems like half the most classic moments are during games he has called, and his announcing has made them more memorable. ("THE SLIPPER *STILL* FITS!!!") I want Gus to announce my kid's Bar Mitzvah. ("AND HOW DO YOU LIKE *THAT* HAFTORAH!!!") But this abomination is going to stretch his talents. Let's hope he gets some better games, if for no other reason than a karmic payback for dealing with this brutality right now. 1:15: Now this will be a trick. With BC/TXTech and MD/DVD both at halftime, CBS is left with the Louisville-Stanford "game" just outside of the under-4 timeout. How do you make chicken salad out of THAT one? 44-16. 1:12: 44-43 Maryland over Davidson at the half. By far the most exciting of the three games (if you can count Louisville-Stanford as a "game.") Hopefully, my MMOD will keep me locked on this great, up-and-down game. 1:10: Who is that player on Maryland, Osby, with the most unbelievably awesome, Artis Gilmore-style hair? All-Hair Team lock! 1:07: Pontiac is selling me a car based on the idea that (a) Bobby Knight can be my Gimp, and (b) that I can coerce game refs with my sweet velour interior to give my team some calls. Sold! 1:05: BC up by 2 at the half over TX Tech. At least it's a game. 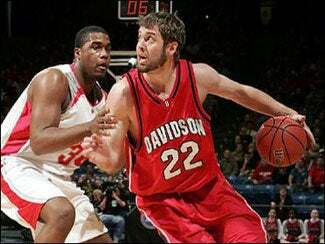 Davidson frosh Stephen ("Steffen") Curry has 16 points already. He's the mid-major's Kevin Durant! 12:58: I have just seen, for the first time, a new Coach K ad for State Farm, asking if I wanted to go to Coach K-coached fantasy camp. But do I have to pay extra for the sanctimony? 12:55: I finally noticed that all the BC players are wearing matching headbands. Isn't that sweet? I wonder if Sean Williams is sitting at home, watching on TV, wearing a headband... quietly weeping. 12:54: I am stuck watching BC-Texas Tech (ugh) locally, when I really want to be watching Davidson upset Maryland. But if I can't get into MMOD, how can I "control" my experience and watch that game? Damn! 12:53: Watching Stanford get thumped by Louisville, there will be nothing more frustrating to Syracuse, Drexel, Air Force and other Bubble-Burst fans than to watch the Cardinal get obliterated. 12:51: Just a hunch: Kevin "Hanes" Bacon is the next coach of the Bobcats. He and Michael Jordan seem to have a pretty tight relationship. 12:49: So I'm getting lots of IMs complaining about MMOD and Macs, which SportsLine acknowledges, to their credit. Doesn't help your problems, though. 12:47: Who do you think Katie Couric has in her Final Four? 12:45: So apparently, Pontiac is selling me cars by promising I can treat Bobby Knight like my own personal Gimp. Sold! 12:28: For now, I have been totally screwed by the on-demand video feed system. Bastards. 12:25: I'm still waiting for the on-demand video feed to LET ME IN(!!! ), so the local CBS affiliate have helpfully moved me to Texas Tech-B.C. Over/under on the number of Enberg "Oh my!" exclamations: 20. 12:24: Is it me, or does the area inside the 3-point line in the Buffalo Arena look like a swimming pool? Any minute now, I expect to see Terrence Howard show up, crying and talking about his movie swim team. 12:21: Yikes, there is NO ONE at the Maryland-Davidson game. Like me, does everyone else think it's better to watch on TV than go to these games? If someone gave me a ticket for free, I wouldn't go. Go, Couch! The "Waiting Room" is fascinating: If you're "VIP," they show your place in line (at 10:27 a.m., I was No. 6,495. Within 20 minutes of logging in, there were 12,000 people already "lined up" behind me — I got bumped out of the line around 11 a.m., and bumped again later in the hour). Currently, the line seems to be stalled. Anyone else having this issue right now? Then there's the "General Admission" line, which I presume is like "steerage class" in "Titanic" (lots of drinking, singing and dancing — maybe Kate Winslet slumming...). Anyway, with just under minutes before games start, I'm slightly obsessed with tracking the line status. Drop an IM if you have any interesting observations about your place. Noon ET: Welcome to the NCAA Tournament Live-Blog: Round 1, Day 1. I'm Dan Shanoff, formerly of here, currently of here. Rather than watching multiple TVs from my annual perch, fighting off the fraternity party at the Park Avenue Country Club in Manhattan, I am at Deadspin HQ with Will. On TV, we are watching whatever the local CBS affiliate is showing. And we're attempting to use CBS' much-balleyhooed "MMOD" service that lets us watch games online as "VIPs." Last year, they apparently had some "crowd-control" issues. If we can't get access today, I will hurtle myself against the HQ wall until I black out — or read Gregg Doyel's insightful stylings until my eyes bleed. But it's not just me posting (and, for a taste, check out my last attempt at live-blogging: Round 1, Day 1 in 2003). Let's get going, with the first games on the table: 12:20 Davidson/Maryland, 12:25 Texas Tech/BC, 12:40 Stanford/Louisville. And my first random question on the table: Which TV ad will get most insufferable most quickly? Because you KNOW by day's end, we'll ALL be expressing surprise at Enterprise "picking us up," wondering why we should eat buffalo wings if we don't have breasts staring us in the face, and figuring out precisely how Cingular is the new AT&T.